I'm just finishing up Animal, Vegetable, Miracle by Barbara Kingsolver. I realize that I'm likely the last foodie to read this. I was also last to the Kite Runner party, I assume I was busy reading Bon Apetit and perusing cookbooks. But I have to say, I really love this book....I mean, obviously I tend to like books that are about food in some way, but I think that the author really does a great job of educating about eating locally and sustainably without sounding preachy. This book encouraged me to visit my farmers market - and buy most of my food for the week from local vendors. I went to the farmer's market without any recipes planned - I just grabbed whatever looked fresh or interesting and planned my meals around what I had in my fridge and pantry. These purple peppers are a perfect example of how I was able to plan my food around what I could get from my local farm, and be inspired by unique items. Have I been living under a rock all these years, or is a purple pepper kind of rare? I thought they were pretty so I wanted them to be front and center in a recipe and I immediately thought of stuffed peppers. When I got home I perused my fridge and found leftover brown rice, half a jar of marinara, some shredded zucchini, feta cheese, and cranberry beans (also a farmers market find) and the heel of one of my sourdough loaves. I poured the marinara into the baking dish while I sauteed half an onion and some garlic until they were soft. I added the zucchini to the pan just to warm it through, then added it to a bowl with the leftover rice. I added some feta and the cranberry beans. I stuffed the halved peppers and placed them in the dish. Then I topped with breadcrumbs from that sourdough heel and baked at 350 for about 30 minutes. These made a great lunch on Sunday afternoon. I think I undercooked the beans, but otherwise this was pretty tasty. I was a bit sad that my peppers lost their purple hue, but as I tasted them, I was less concerned with their appearance - the were delicious. You're the second to last foodie to read it....because I haven't read it yet! These stuffed peppers look so hearty and I love finding interesting colors like the purple peppers! Those look so filling and delicious! I'll have to check this book out of the library. 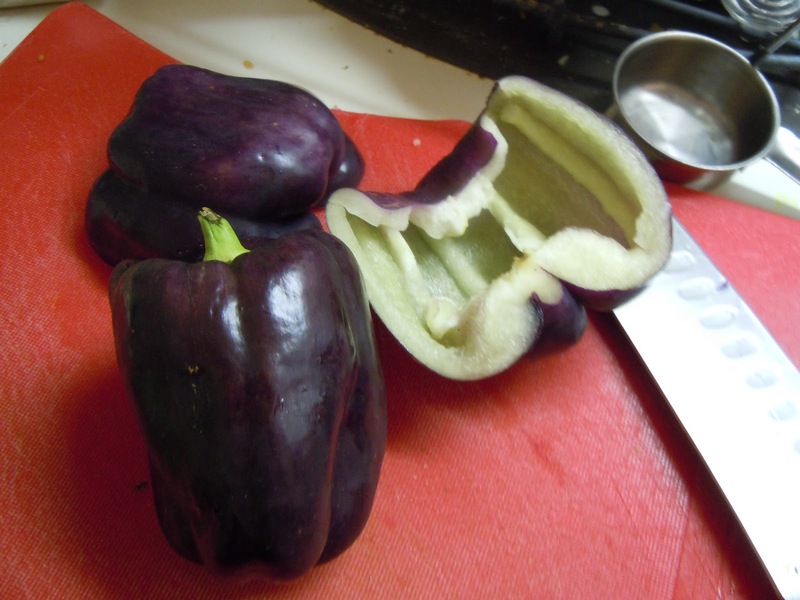 Nice purple peppers you've got there! Looks like a great meal. those peppers looks so pretty. I have also never seen that color on a pepper! Those purple peppers are gorgeous!!! YUM! Stuffed peppers with purple peppers-love it! 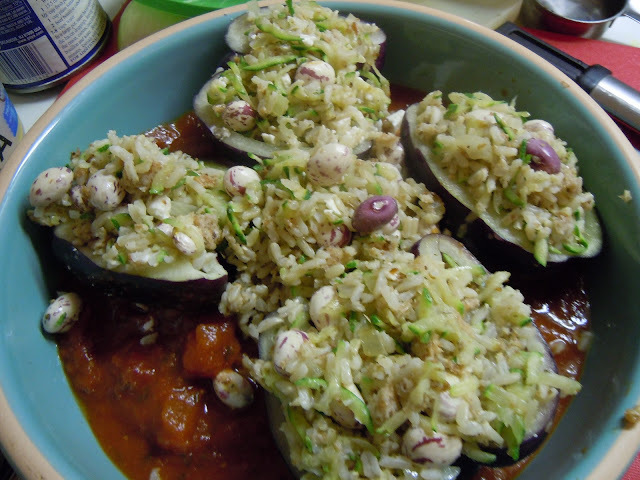 I find that green peppers get really bitter when I make stuffed peppers with them- did these purple fare better? 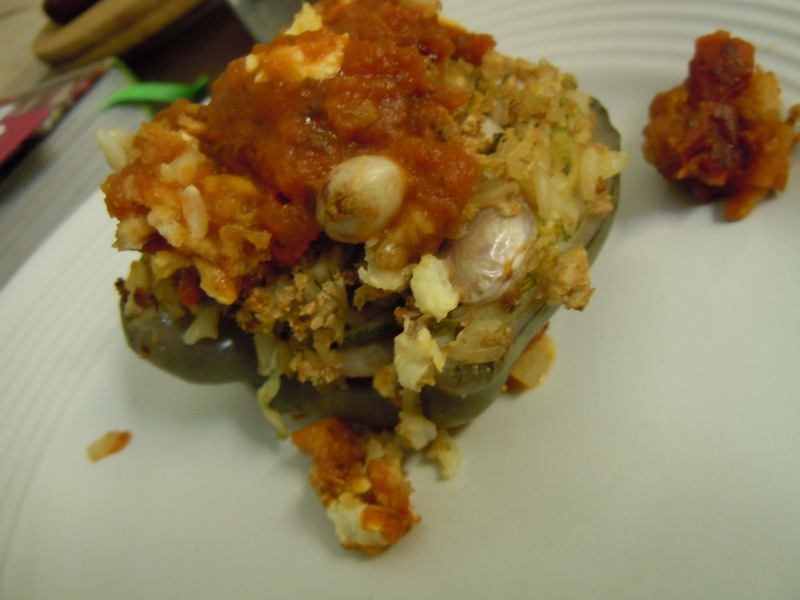 I loooove stuffed peppers, and using purple peppers makes them that much more fun! These look awesome! How pretty! I love that you used purple peppers! I haven't read it yet! Blog, magazine, cookbook, and wine reading definitely take up most of my time. I never make stuffed peppers, but they are so yummy and versatile, I totally should. These look great! I have also not read it and will add it to the stack next to my bed as well! the purple peppers and speckled beans looked so beautiful! That would be amazing!! I've been acting lazy and driving to yoga (my apartment is in the back bay so its ultra terrible) but I could drive us to central - annnnd give you a ride back to your apartment! I loved stuffed peppers. They look healthy and hearty! I've never seen purple peppers. That looks like a pepper crossed with an eggplant! I haven't read the Kite Runner if that makes you feel better. In the midst of The Girl with the Dragon Tattoo series -- sooo good!